Not your average Brussels sprout! In a large bowl, combine Brussels sprouts, onions, garlic, white cheddar, rosemary, thyme, flour, salt, and pepper. Toss to combine. Coat a 9x13-inch pan with cooking spray and transfer Brussels sprout mixture to pan. Pour half & half over Brussels sprouts. 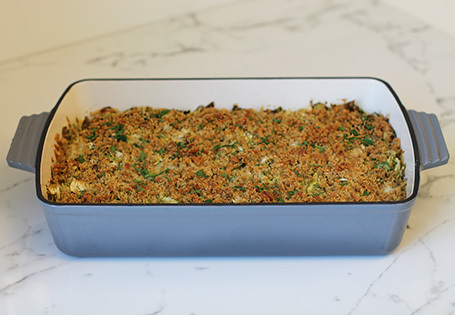 In a small bowl, combine parmesan, breadcrumbs and olive oil. Mix until combined and sprinkle over Brussels sprouts. Bake for 30 minutes or until golden brown. Add fresh parsley and serve. Tip: This can be made ahead of time. Add all ingredients in step 1 besides half and half. Wrap in plastic wrap and keep in the refrigerator up to 2 days. Add half and half right before baking and continue with remaining steps.